Forget everything you know and hate about the old air splints. This isn’t about that. This is about the air splint that actually lives up to its name and its potential. 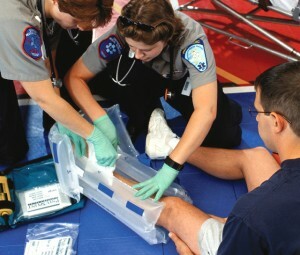 The PneuSplint – Inflate First Disposable Air Splint. It’s the first and only air splint that adjusts quickly and easily to any arm or leg — straight or at any angle. It’s easy to re-adjust or re-apply, it’s compact, disposable and highly effective for better patient care and outcome. It’s not a cardboard splint or a vacuum splint. So you don’t have to worry about infection control or cleaning or getting it back from the hospital intact.